Instapaper is an indispensable app that saves lengthy online articles and re-formats the text for easy reading. The Kindle, meanwhile, is one of the best e-readers around. Can we get these two together? Turns out we can—and indeed, you can set Instapaper to wirelessly send your Kindle a daily digest of your latest saved stories. Here’s how to do it. 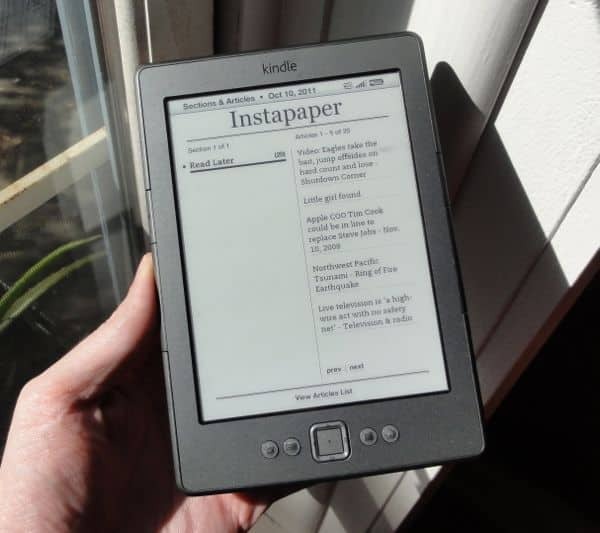 First, a little background on Instapaper, a free online service that’s a must-have for bookworns. The site itself is simple: just sign up for an account, and add a “Read Later” bookmark to your favorite web browser. Whenever you happen upon a long online article (from, say, a newspaper or magazine website) that you’d like to curl up with for a leisurely read, just select your new “Read Later” bookmark to send it to your Instapaper reading list. Your can then peruse your saved articles online in an easy-to-read format, stripped of all ads, sidebars, and other distracting elements. Instapaper also offers a $5 app that saves articles to your iPhone or iPad—perfect for reading even when, say, you’re on a plane, in a subway, or otherwise without an Internet connection. But what about the Kindle, which is rapidly becoming one of my favorite ways to read e-books? Well, Instapaper makes it easy to send your most recent saved stories to your Kindle—no wires required. There’s one catch: While you can receive e-mail on your Kindle over Wi-Fi for free, Amazon will charge you a small fee for transmitting articles over the Kindle’s 3G receiver. The charge is 15 cents a megabyte if you’re receiving stories in the U.S., or 99 cents/MB overseas. Just so you know, I sent a batch of 20, rather lengthy Instapaper stories to my Kindle, and the file was barely half a MB (the fee is rounded up to the nearest MB); still, those charges can add up, especially for globetrotters. If you haven’t already, head to Instapaper, set up an account, install the “Read Later” bookmark in your browser, and start saving some stories. Since Instapaper will be sending articles to your Kindle via email, you’ll need to make sure your Kindle is ready to accept email. Visit this page, go to the “E-Mail Settings” section, make sure the “Auto Deliver” setting is set to “Enabled.” Also, make note of your Kindle’s email address (yes, your Kindle has its own email address); it should be your Amazon.com user name with “@Kindle.com” tacked on at the end. Now, let’s head back to the Instapaper.com site. Visit this page, and click the checkbox next to “Send my Unread articles to my Kindle automatically. You can configure how often you’d like Instapaper to send bundles of stories to your Kindle—either daily or once a week. You can also set Instapaper so it will only send an email after you’ve saved a certain number of articles to your Instapaper account. Click the “Save changes” button, then go ahead and click the “Send now” button to make sure everything’s working properly. Bonus tip: If you’re only receiving Instapaper stories on your Kindle over Wi-Fi, make sure to sync your Kindle before you head off to the airport or the pool. Looking for more Kindle tips and news? Click here!